This sauteed tomato breakfast crostini is made with chargrilled ciabatta bread, burst cherry tomatoes with balsamic vinegar, pepperoncino, basil and topped with perfectly cooked poached eggs. First, slice the ciabatta bread and sprinkle with a little olive oil then place on a hot griddle pan until charred on both sides. Sprinkle with sea salt flakes and set aside. Slice the cherry tomatoes in half and add to a non-stick pan with a little pepperoncino (chilli flakes), balsamic vinegar, salt and pepper. Saute the tomatoes for 5-7 minutes until soft (photo 4). Keep them warm until the egg is ready. To make the poached eggs bring a pot of water to a boil then turn off the heat. Crack an egg into a ramekin, hold it for a second then pour it in to the water, repeat with all. Let them poach for around 4-5 minutes then remove with a slotted spoon and pat with kitchen paper. 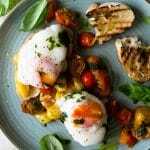 Place a slice of toasted ciabatta on a plate, top with tomatoes and a poached egg. To make the basil oil simply grind fresh basil leaves and olive oil using a motar and pestle for a few seconds and drizzle over. This would be a great way to use up leftover veg. Try adding aubergine (eggplant), zucchini or roasted potatoes chopped up. The basil oil is so easy to make and I love it but it is optional, you could also tear up some basil leaves into the tomatoes as they are cooking instead. Forget adding vinegar or swirling the water, there's no need for that. You MUST use the freshest eggs you can get. Buy the eggs the same day or the day before (at max). I can't stress enough how important this is, old eggs always fail. Crack the eggs (one at a time) into small ramekins before pouring them into the water. Bring the water to a rolling boil then turn the heat off completely, then as quickly and carefully as possible lower the eggs into the water. To pour the eggs into the water. One at a time lower the ramekin into the water until it reaches the rim of the ramekin then pour in. Have kitchen paper on hand to pat them dry of excess water. Use a slotted spoon to remove the eggs with ease.